The picture below shows the launch-view of The Handicapper. ​The software is ready to use and does not need to be installed. Please note that some antivirus software does not like the file (.exe) and you might have to make adjustments to the settings of your antivirus software for The Handicapper to work. The first time you launch the software you should download the data package by clicking on the icon (1) shown in picture 1. Once the data package is downloaded the software is launched by pressing the 'Proceed' -button (2). A data update with game and player stats from the most recent match-day is usually ready 12-24 hours after the last match has finished. The data update is done by pressing the highlighted icon shown in picture 1. 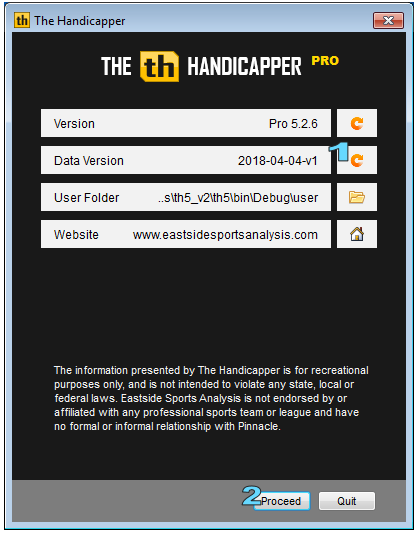 All program files, which are included in the data package that can be downloaded/updated on a daily basis, are located in the 'The Handicapper'\data -folder. 'The Handicapper' is the folder the .exe-file (th5.exe) is located in. The data consists of text-files, which holds all the information that The Handicapper needs to run. User data files are files that are custom to the user, or can be customized, and are created at run-time. These files are located in \data -folder. From time to time there will be software updates. These are installed by replacing the th5.exe -file with the new one (which is also named th5.exe). Nothing else needs to be done for the update to take place.